Diggers Valley: 15 September 2018. The week beginning the 15th of September 2018. On the mat outside our front door this afternoon, a Bumble Bee was bumbling in an exhausted manner. 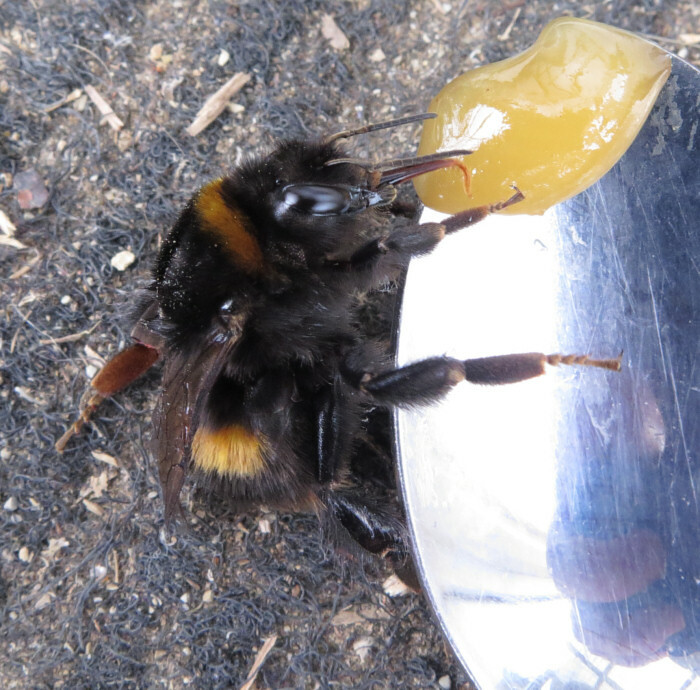 I brought a spot of honey out for it, on a spoon. When I came back later, the bee had gone, perhaps restored sufficiently to fly away home. On my walk, while checking on the two bulls and the steer in the Tank paddock, I stopped and looked closely at these trees. 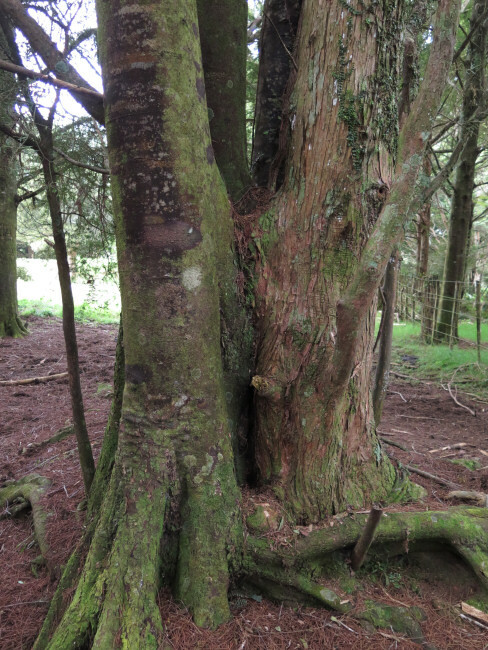 On the left is a Kahikatea and the rough bark is that of a Totara. 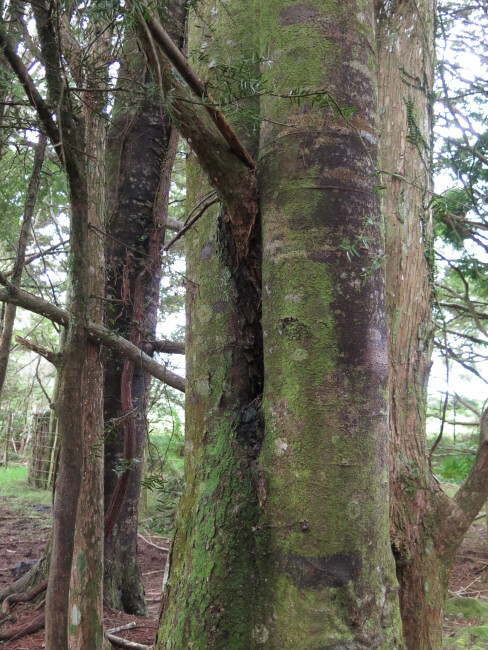 ... emerging from between the double trunks of the Kahikatea. The trees have grown into each other. 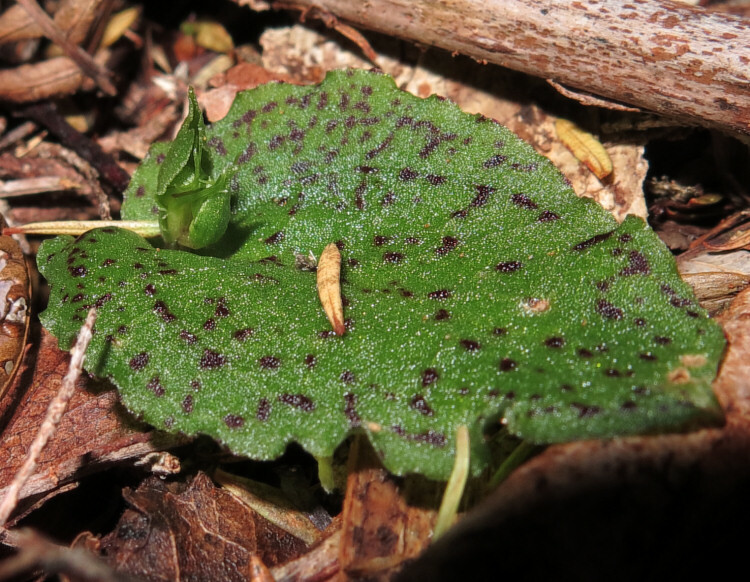 This Puriri is in the reserve area on the stream-bank between the little Camp and Tank paddocks. 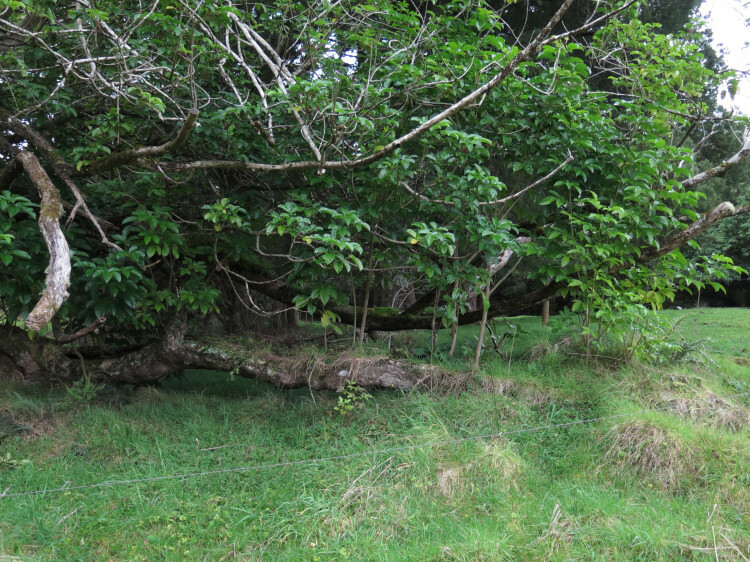 Protected from the cattle, the sprouts along the long-fallen trunk have been able to grow into what will become whole trees, in coming decades. Back to the orchids again. 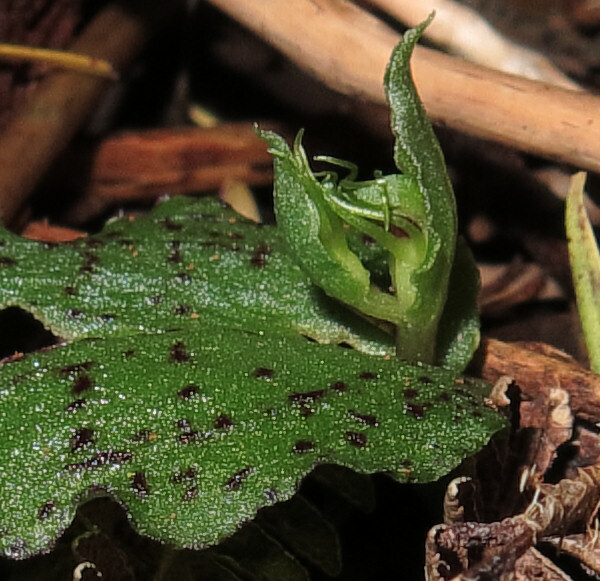 I mean I am very excited to see these orchids coming out, since I've not seen them before. 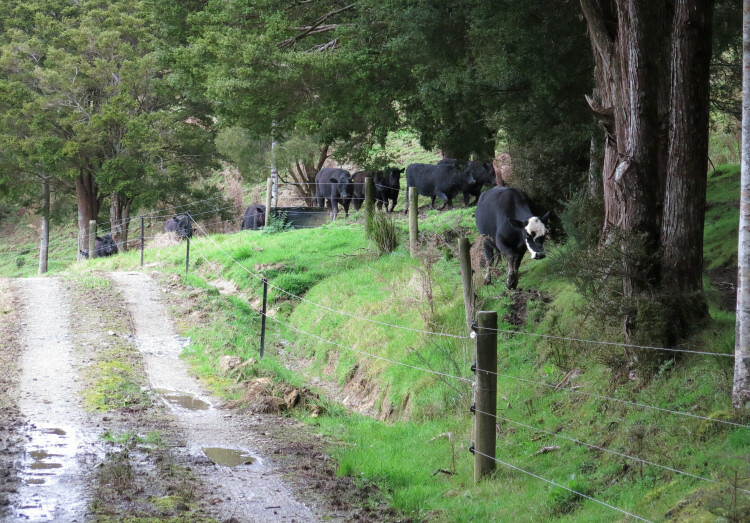 The heifers watched me coming back across the Bush Flat from their now-muddy bottom corner of the Small Hill. I moved them around to the PW. 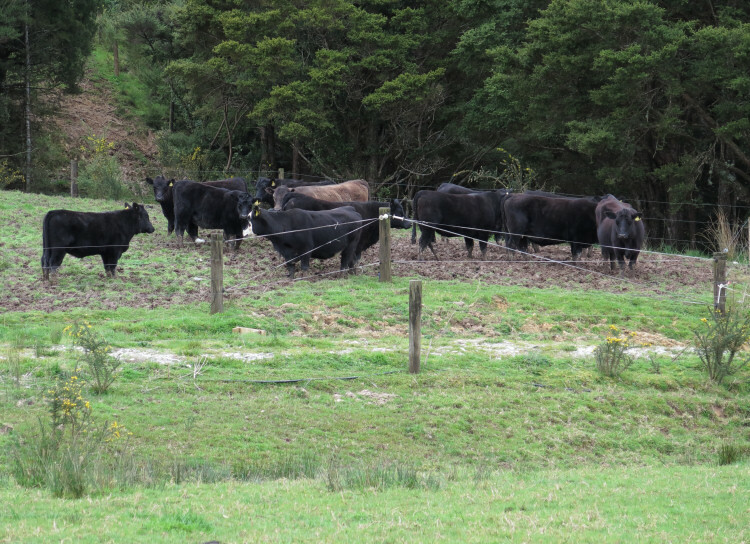 I've been trying to determine whether or not the two grey heifers are missing each other. There have been occasional calls from the hillside, which have made 807 look up from grazing in Flat 5, but I can't really know if I've made them desperately unhappy by separating them. 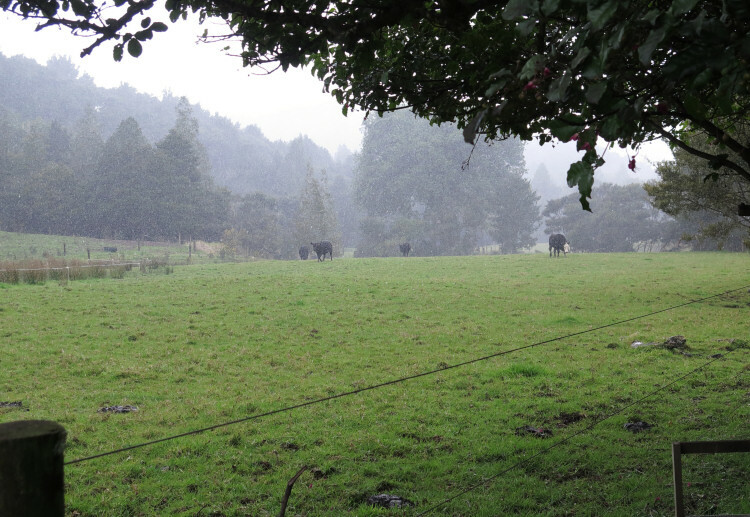 I went out to move the cows into the Bush Flat in what seemed to be a fine morning, until a very heavy shower began to fall. Fortunately I wasn't very far away from the big trees in the Bush Flat, where I sheltered until it had passed. Under big trees there's a point of balance when the rain slows, between being drier under the tree out of the falling rain or wetter there as big drips start to fall from the leaves above. The thin cow mob went into the Spring. They're ok, condition-wise, I think. The thin cows just seem to be thin cows, rather than cows who didn't eat enough and will get fat over winter if they have more feed. That might be true for some of them, if we had loads of grass but some are just always thin and my aim is to ensure they don't lose condition over winter. In town today we went to the library and looked for some children's books in te reo, thinking they would provide us some reasonably simple practice. There are some beautiful books around! We read one this evening, Whiti te R&amacr;!, translating lots of words we weren't familiar with but making our way steadily through the book. It took us about two and a half hours. Even on wet ground there's often somewhere dry to sit, if you have the freedom to find it. 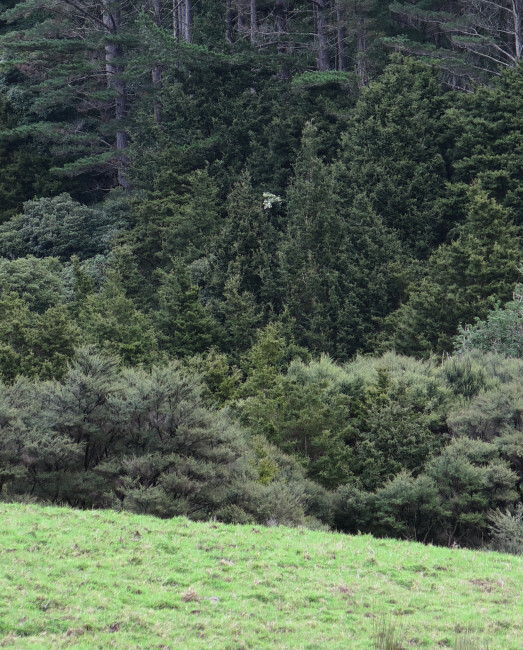 The steer was on this little dry lump, one of the bulls just behind me on the open grass and the other bull, tucked away under a Totara just up the hill. Over the last couple of years there seems to have been an increasing flow of water through (over and under) some parts of the Tank paddock. 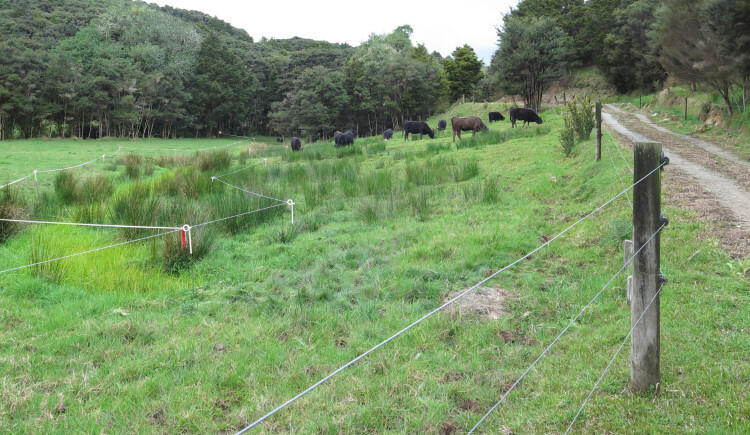 This sinking section is above a known underground flow and will eventually fall in to create anther deep hole, as the soil beneath is carried away toward the stream. The heifers are a much more cooperative group than their mothers, when I call them to follow me somewhere. They came along the bottom of the PW as I called from the track, taking them along to the Route 356 gate and around into the top half of the Blackberry paddock. Nobody has grazed this side of the drain in the Blackberry for many weeks, so the grass there was a welcome treat for the heifers. 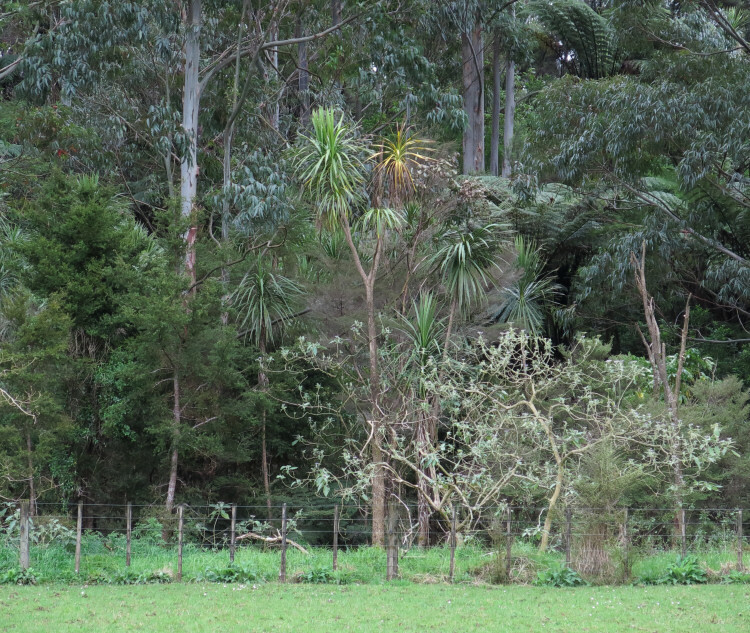 This Cabbage Tree, on the boundary adjacent to the Spring paddock, looks like it is suffering from Sudden Decline. 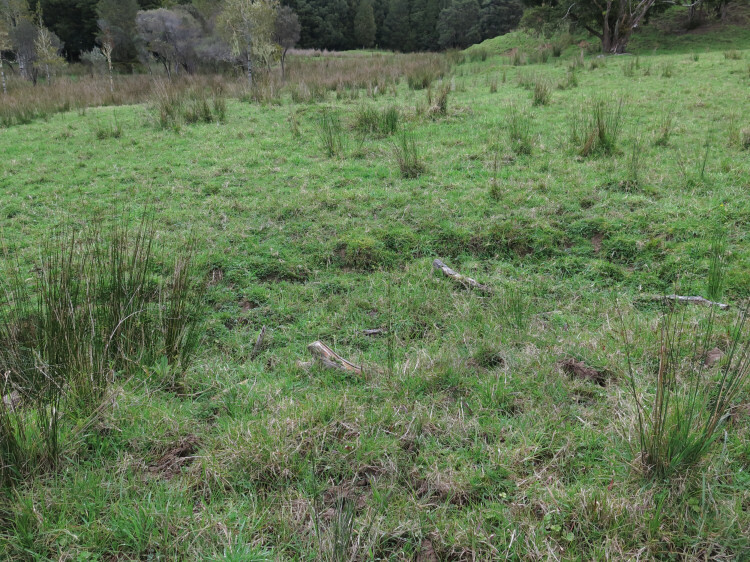 The big slip in the Spring paddock appears to have moved again over the winter. 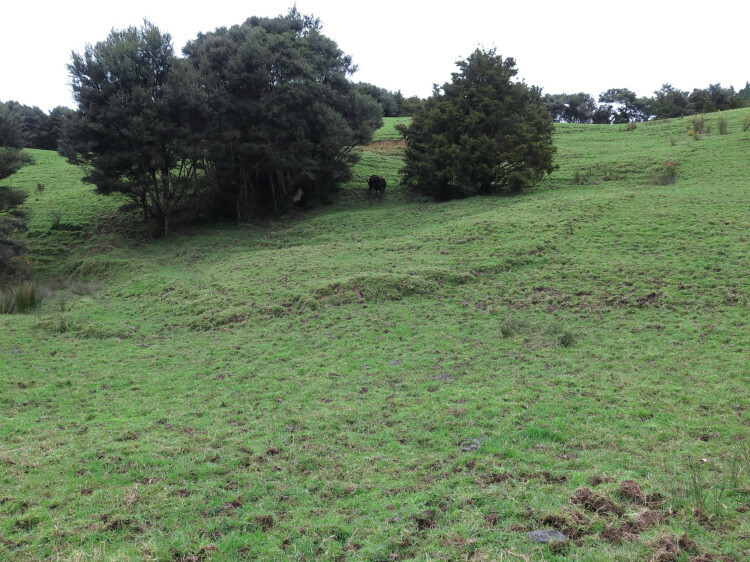 If you look up the hill from this lower ridge in the ground, then track around just below the brow of the hill, you may detect the line of its boundary. The left edge begins with the bare-earth slump visible between the trees and comes down through the left clump of trees, which also appears to be on the move. A Clematis vine out in the bush in the Pine plantation beyond our boundary, in flower already. I haven't yet noticed any of the those on the farm yet in bloom. While on the top of the ridge, I heard a Pipiwharauroa, the Shining Cuckoo, down in the gully between here and the Middle Back. They are the local harbinger of spring and reports of their calls have lately been reported in the local newspaper. There's an informal competition to be the first to report that the birds have been heard each year. 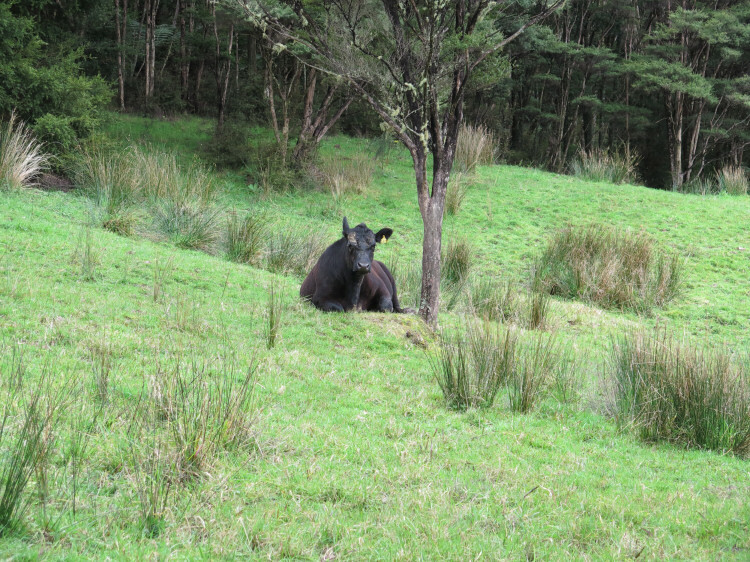 742, one of the thinner cows in the thin mob. When one looks at the cattle all the time, it's easy to lose track of how they really look compared to how they should be. I hope I've learnt that lesson sufficiently in years past, so that I am not fooling myself that this cow is not in too poor a state. In my calendar for this week, I had made a note to copper the cows again, six weeks since the last time and before they get too close to calving. 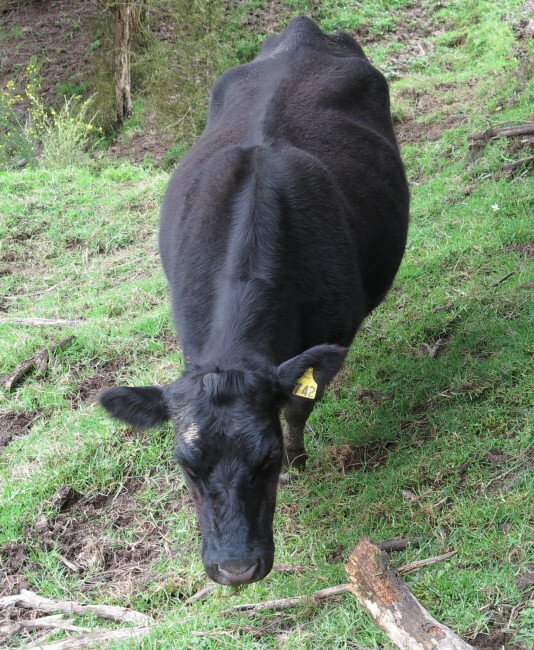 The directions for copper supplementation are to do it at no less an interval than four months but our liver tests on the cull cows indicate that the level of deficiency is such that they require it four times a year. One of our vets at some stage said that six weeks would be an acceptable interval for these cattle. This year I was late starting and they had one shot in June, one in early August and this now. I'll try and give them another before mating, then I will start again in about March, so I don't have to concentrate the injections quite as much next winter as I have this year. 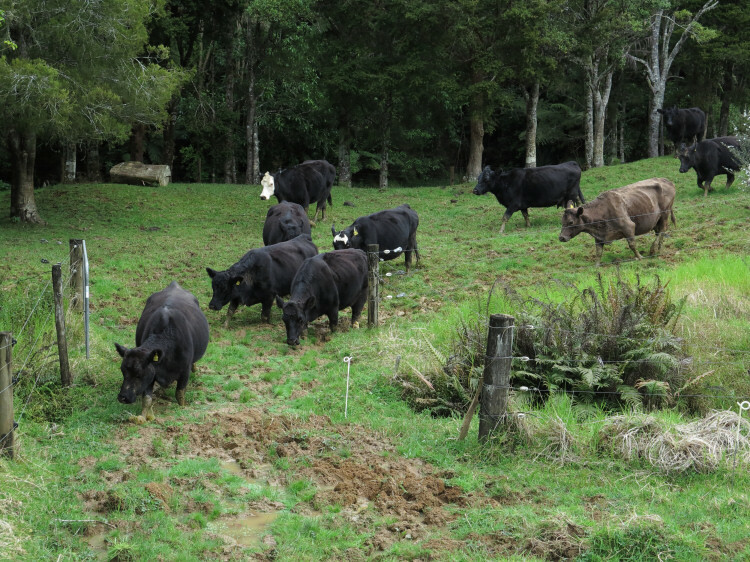 We had begun with the thin cows from the Spring, then drafted the three non-pregnant R2 heifers out to the Pig paddock. 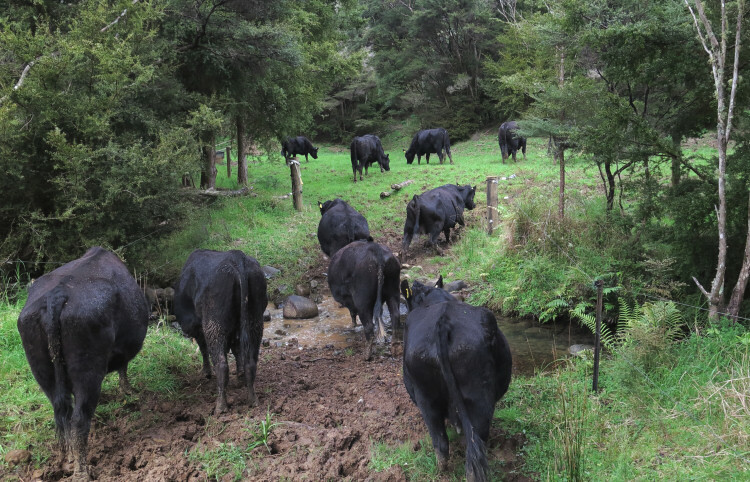 From the young mob I drafted out the four pregnant heifers and sent them off on their own, while the others joined the three in the Pig paddock. Gertrude 162 thwarted my efforts to keep everyone calm (as is recommended after the copper shot) by making a horrible racket and chasing some of the others around for several minutes. 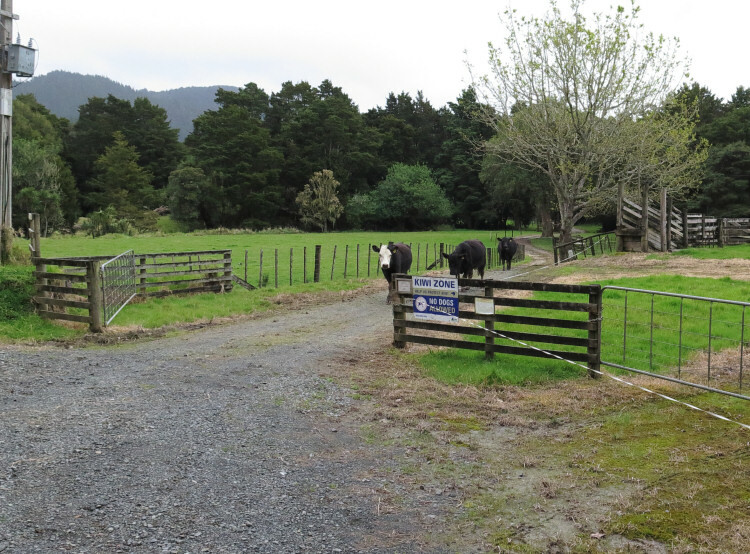 From the main cow mob above, I drafted Meg and the two non-calving R3 heifers into the Pig paddock and left them all to get acquainted with each other, while we had a break. A couple of hours later, we put those 14 animals across the road. Today whenever I rode up the lane on the bike and came across the little Plover chicks, now indistinguishable from their parents in all but size, they spread their wings and gently lifted themselves away over the fence and into the paddock. It is time for the annual Eva's Calving Date Competition. Please ENTER HERE by midnight 1 October.